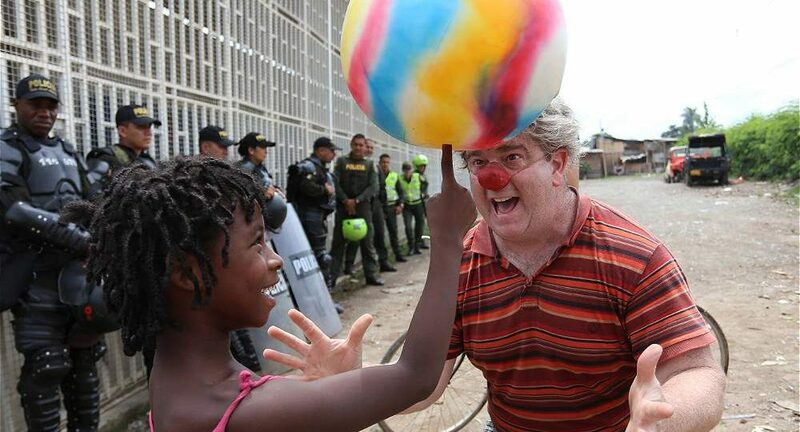 Clowns Without Borders has worked in collaboration with CaliClown and Pasos De Payasos since 2009, bringing laughter through workshops and performances in collaboration with local artists, to children and families in the nation’s capital and rural areas. Colombia has had a convoluted history of political conflict from government militia, guerrilla groups, and criminal organizations that have made the nation home to one of the largest internally displaced populations in the world. According to the Internal Displacement Monitoring Centre, Colombia has an estimated 5.7 million internally displaced people. Mass displacement and intra-urban displacement has been on the rise, where many seek shelter in host communities due to the lack of displacement camps providing adequate living situations. The rural poor and marginalized areas are especially at risk of being taken control by violent powers and the internal conflicts have harmed local communities with “forced recruitment of children and youth, sexual and gender-based violence, threats, disappearances, and murders.” These issues do not come to a halt after a population seeks refuge, and these violent crimes infiltrate into host communities. Along with the ongoing political issues, the country has faced environmental crises such as the series of ongoing floods during the rainy season in recent years. Emergency relief has been of overwhelming need with proper assistance lacking in organization and implementation in responding to these issues.